Endearingly odd folk pop musician Jenny Mitchell steps out from the Barmitzvah Brothers for an interesting record with an impressive guest list. 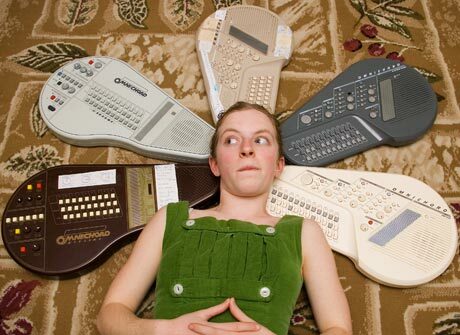 Mitchell has long loved the omnichord  an electronic instrument most often used for subtle atmospherics by artists like Daniel Lanois, U2 and Arcade Fire. On rare novelty EP Jenny Omnicovers "These Eyes, Mitchells first stab at omnichord-based songs was rough and, well, pretty silly. For Cities of Gifts and Ghosts, Mitchells work is much more heartfelt, delivering her own compositions earnestly and assembling a remarkable array of producers for each one. Don Kerr accents an amusing rap by Mitchell on "Kings of London, while Evan Gordons "Nintendo City is self-explanatory. Jim Guthrie plays around with "Moby and Bob Wiseman puts his signature on the quirky "Lottery. Mike Olsen does wonders with the metropolitan "Buildings, while Scott Merritts "Skeletal Love Song is eerily heavy. Dave Clark has the most fun with "The Birthday Song, which isnt as surprising as an Eccodek re-mix of "
And in the Cold. Charming and diverse, Cities of Gifts and Ghosts is thoughtfully ambitious, serving as a proper coming out party for Jenny Omnichord. It was the first instrument I ever played and I got one eight years ago. At first I played it out of guilt; I thought it was a ridiculous instrument but my dad paid like, 80 dollars and I felt bad. When I learned more conventional instruments, the fact that I started out on something so underrated really appealed to me. I had this lingering love for the first instrument that found me. I felt this project would really suffer if it was only looked at from one angle; its only one sound and one voice and if I went with one person how could they possibly make each song distinct? It was also a way to satisfy my curiosity about all these people whove offered to help over the years. Whos someone you couldnt get for this?